I had been considering getting into Portland’s expansive and diverse gallery scene for a while now, but couldn’t think of where to start or what to do. One of my first contacts when I arrived in the city six months ago was Chris Haberman, owner of the People’s Art of Portland and Po’ Boy Art & Framing. At a gallery showing for Emek, when I told him of my interest, he said “Well, why don’t you just participate in the 300?”. 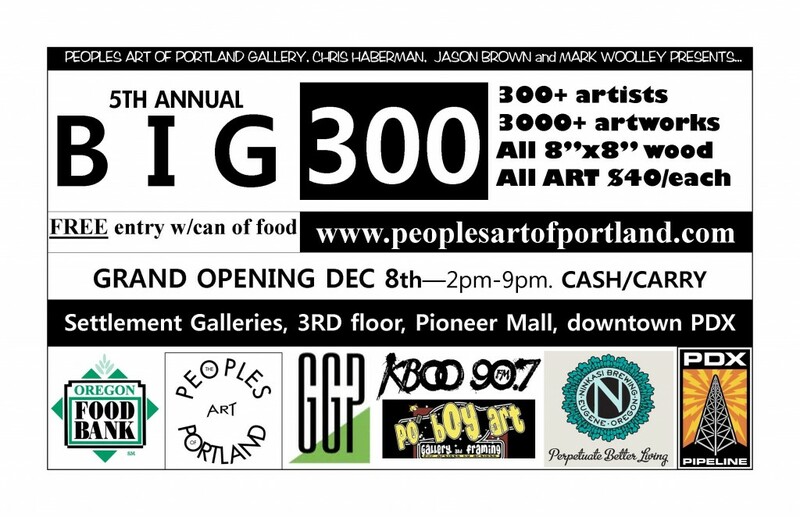 “The 300” is something POAP does every Christmas where they provide as much as ten 8×8 inch wood blocks to local artists (free of charge), let them do whatever they want (painting, sculpture, mixed media, etc), and sell them uniformly for $40 at a massive showing. Three-quarters goes to the artists, while the remaining money goes to the Oregon Food Bank. I figured this would be a perfect start and jumped at the chance. Now when I came to Portland in May, I came with a duffel bag of clothes and a suit case full of tech. The rest of my books, gear, and supplies stayed back home in Illinois. To top it off, at the time I didn’t have a ton of money for art supplies (and I still don’t), so I could only do so much. So how could I produce ten whole pieces for the show while claiming an identity for myself and not spend a lot of money doing it? Well, I took a page from Erika Moen‘s book and combined my regular illustration skills with papercraft and mixed media. As for the concept or theme, I did ten pieces based off the nine Muses of Greek Myth (a subject I’ve long had an interest in), with Apollo (the leader of the Muses) functioning as the tenth piece. So all the pieces were essentially put together with marker, watercolor, construction paper, and Modge Podge. I’ve been dying to show them off and comment on them, so here we go. 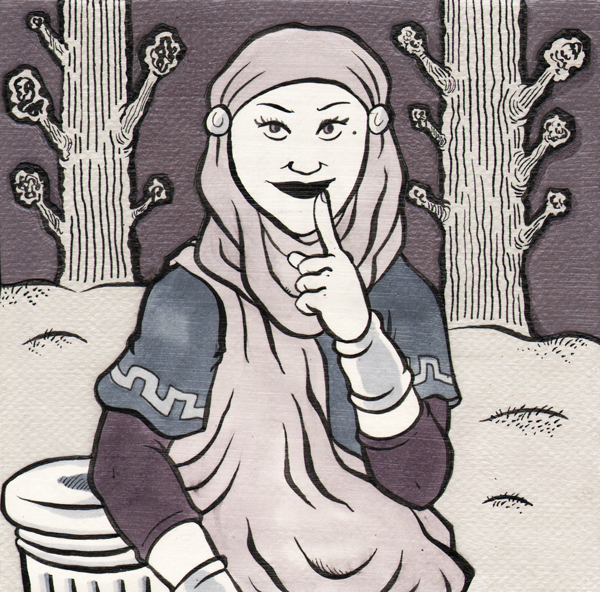 Polyhymnia’s nature goes beyond being the Muse of Hymns; she’s also the Muse of Pantomine (hence the finger to her lips), Prayer, Meditation, and Contemplation. In short, she’s a religious or spiritual muse. To this end, I gave her an outfit between a classical Greek toga and a Muslim veil, Muslims in particular being very solemn and dignified with their worship. When it came to the background, my partner-in-crime Stefanie suggested I based it off the “Ave Maria” segment from Disney’s “Fanastia”, hence the look of the trees. At the time, I was considering doing all the Muses in black and white with the occasional splash of color, but that was quickly abandoned. If I could go back, I might make the trees a faint green with maybe some dark blues to enhance the “Ave Maria” connection. But these are just nitpicks and I’m proud of what I came up with. 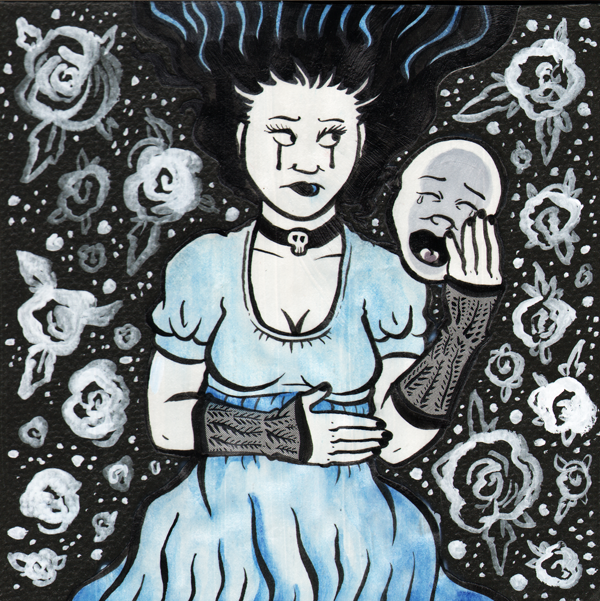 The beauty mark next to her eye was also a reference to “Persepolis” artist Marjane Satrapi. Thalia’s appearance was a cross between Harley Quinn (mostly in the outfit), and Pinkie Pie from “My Little Pony: Friendship Is Magic” (mostly in the poofy, curly hair). Thalia is often associated with ivy, hence why it hangs from her ears. 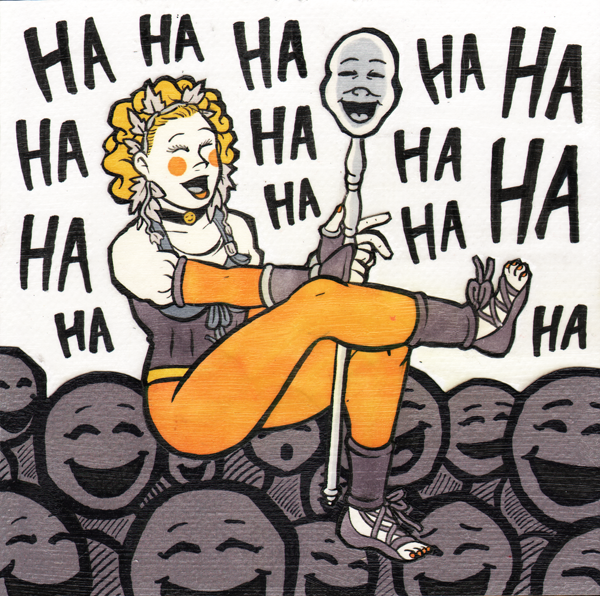 The Comedy Mask on her staff got smeared with the markers on my initial run, but here lies the advantage of papercraft. I merely cut off the smeared mask, drew a new one, and pasted it on before clear-coating it. After the clear-coat was dry, it was barely noticeable. At this point I had pretty much abandoned working only in black and white. I knew from the beginning Terpischore’s basic appearance would be that of a ballerina, but I tried to throw in other little bits too. Her shirt is based of ancient Greek dancers, yet it hangs off the shoulder like a dancer in the 80’s would have a la “Flashdance”. 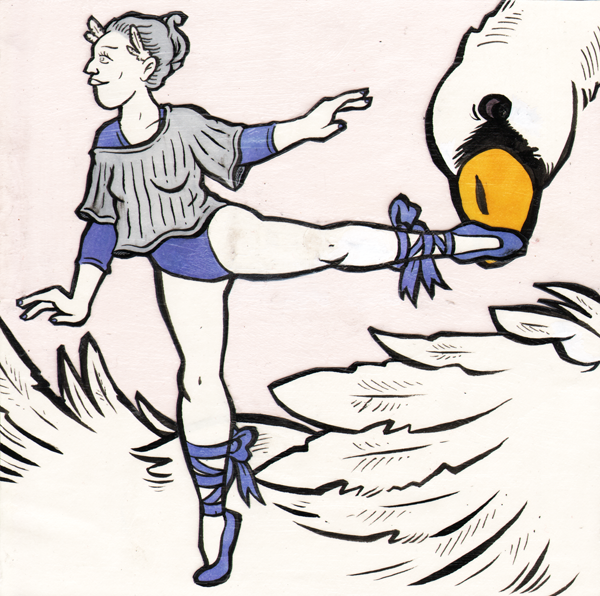 And the giant swan not only refers to the classic ballet “Swan Lake”, but also Cygnus, the form Zeus (King of the Gods and father of the Muses) would take on his excursions with his many mortal lovers. 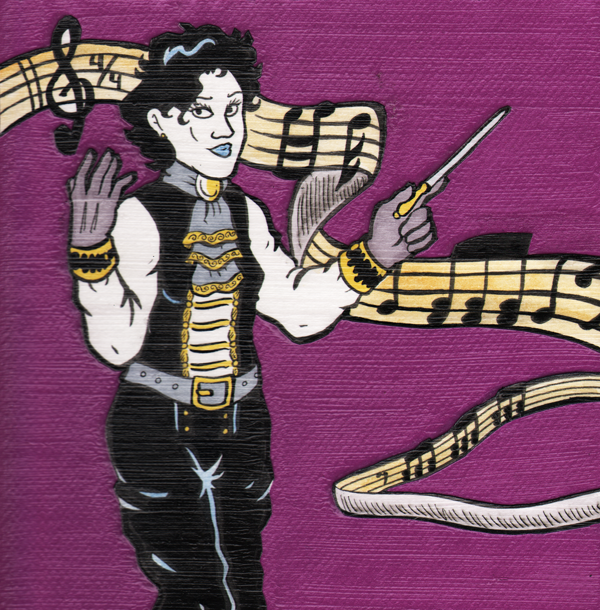 I think I was going for something recalling Falco or Adam Ant on this, but with the outfit and purple background it probably invoked Prince more than anyone else. The 4/4 is a sly reference to how this was the fourth piece I had completed. This one was easily the most dense, and I knew that no other piece after it would have as much “stuff” as this one did. 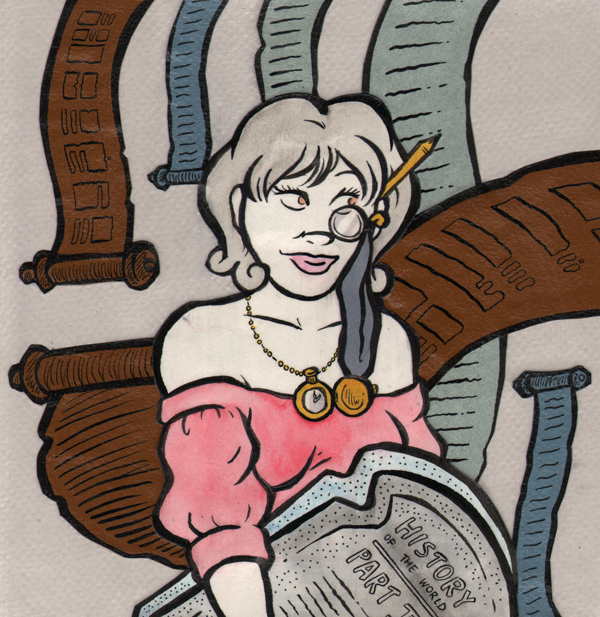 Her base form is a Valkyrie, but her sword is in the shape of a pen (the pen and tablet being Calliope’s “symbols”). The waves and ocean are inspired by water in Japanese Ukiyo-e paintings. 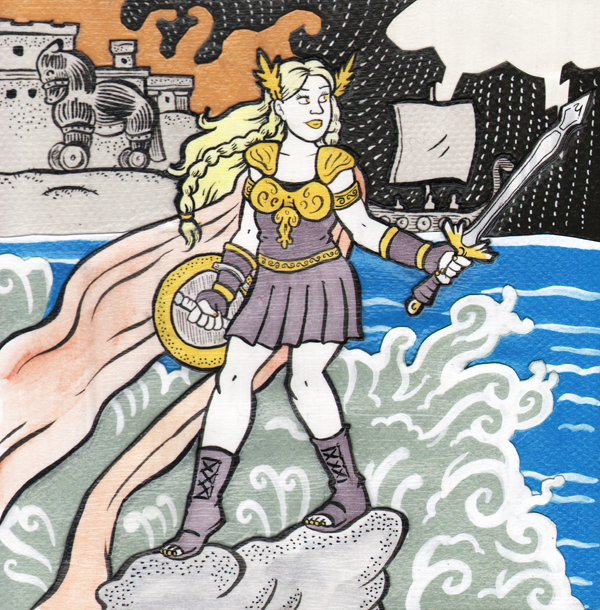 Since Calliope inspired the epics of Homer, you can see the Trojan War on the left (“The Iliad”), and Odysseus’ ship setting sail on the right (“The Odyssey”). 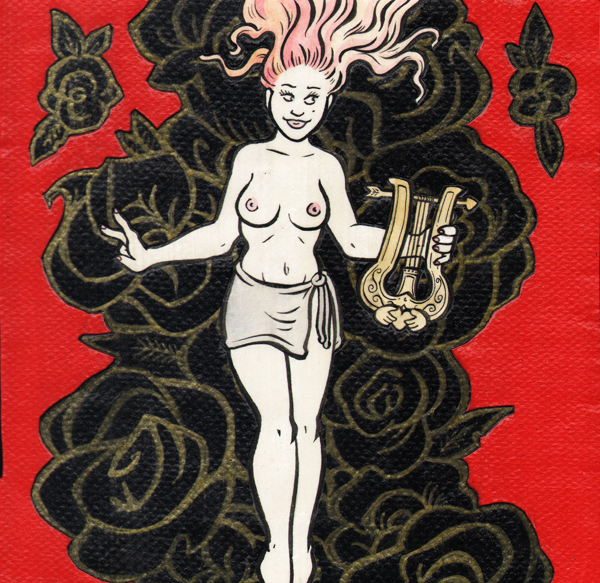 The hair, roses, and pose were inspired a bit by the movie “American Beauty”, but the way I rendered the roses (with a gold paint pen on black paper) reminded me a bit of Chinese lacquer art. I also included a bit of my Irish heritage by putting the Claddagh on her lyre. This one was the most challenging to put together after “Calliope”. 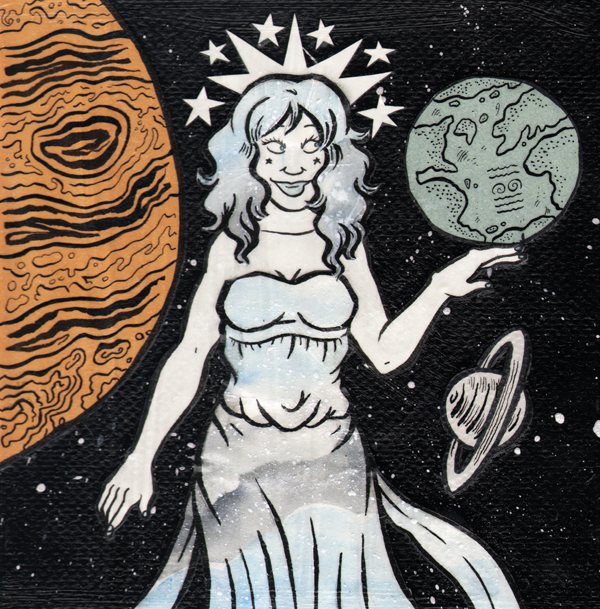 I drew her hair and dress separately from her body, applied the watercolors, then splattered white ink to get the star effect. I then inked the outlines, cut them out, and pasted them to her body like she was a paper doll (which essentially she was in this instance). Adding Jupiter (the Romanized version of Zeus) just came to me as I was completing it. I also threw in the Aquarius symbol (my Zodiac sign) on the Earth as a fun little signature. I think originally I had imagined Clio’s scrolls to be like portals into history, draped around her like curtains. I don’t know how well that comes across here, but I think the composition works in the image itself. Her sweater and hair are references to Velma from “Scooby Doo”, and the tablets refer to the Mel Brooks movie of the same name. This one was the hardest for me to conceive, so in the end I just went for what came naturally. Her general pose was inspired by the drowning of Ophelia in Shakespeare’s “Hamlet” (one of the greatest tragedies of all time), and the design on her arm warmers are based off Cypress, the plant Melpomene is most associated with. The white flowers were inspired by bouquets in funeral arrangements. I knew no matter what I did with Apollo, his background would be gold. After drawing nine ladies, I decided to do some male fan-service with the shirtlessness and leather pants. Then again the leather and simple appearance made sense to me since Apollo was a hunter, but also an artist (hence the lye). 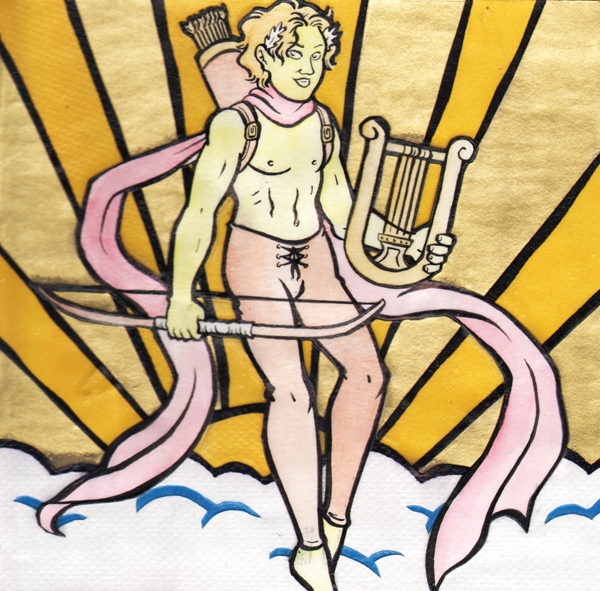 Since Apollo was also frequently portrayed as bisexual (though what Greek God wasn’t), it made sense to put him right in the middle of a masculine pursuit and a feminine pursuit. So there we go! Worked hard on these, hope you like them. Feel free to promote the 300 event so they sell!